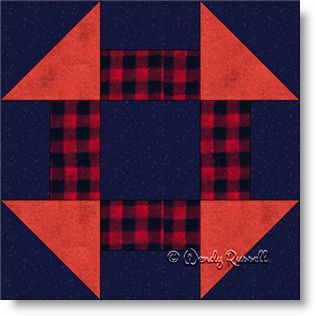 The Churn Dash quilt block is an easy nine patch block made with simple shapes -- rectangles and half square triangles. It's a good choice for a beginner quilter to learn how the patches go together. In any event, it makes for a fun block to construct. The sample quilts illustrated are shown with a side by side block setting and an on point setting, and both use sashing strips to separate the blocks. I deviated from the usual colour selection of fabrics, as I chose to make the background fabric a dark value, rather than the traditional light fabric. What can you come up with?